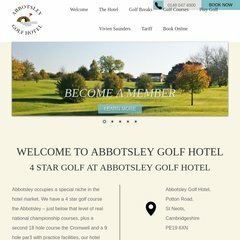 abbotsley.com Contact Abbotsley Golf Club, a golf club and golf course in St ..
abbotsley.com Golf societies, golf groups, corporate golf days in St Neots ..
abbotsley.com Pro Shop at Abbotsley Golf Club, a golf club and golf course in St ..
abbotsley.com Abbotsley Golf Club: Golf club and golf course in St Neots ..
abbotsley.com How to join and become a member of Abbotsley Golf Club in St Neots ..
40 users visit the site each day, each viewing 10.00 pages. It has 2 DNS records, ultra104.uk2.net, and ultra103.uk2.net. It is hosted by Gemini Network Media Ip Space England, using Apache/2 web server. Abbotsley.com's server IP number is 92.52.105.155. PING (92.52.105.155) 56(84) bytes of data.